The Reserve Bank of India (RBI) has occupied a special place in my thoughts ever since I was here as a Special Adviser thirty-four years ago. It was an immensely enjoyable period of my life, not least because my ring-side position taught me more about public policy than any number of scholarly books and papers. Public policy was also the mission of Mr. L.K. Jha’s exceptionally distinguished career. He was, without question, one of independent India’s foremost public servants, and a truly remarkable man. For most of his time in the Government of India (GOI) and the RBI, extensive and intrusive state intervention was the order of the day. But he was far too good an economist and far too wise an administrator to be taken in by the pretensions of centralized planning and quantitative controls; and, in consequence, he became an advocate of economic reform well before it came to pass. I am, therefore, greatly honoured to be delivering a lecture that bears his name. I would like to thank Governor Patel for the gracious invitation to speak on this occasion. Since he took office, the RBI has faced many severe pressures. His astute, creative, and resolute leadership, as well as his nerves of steel, have enabled this institution to enhance its reputation as a pillar of India’s stability. There can be no doubt that India has done remarkably well in the past three decades, and I could easily spend an hour singing the praises of the country’s success. However, in today’s lecture, I want to focus on the half-empty, not the half-full, cup of achievement. India still has around a quarter of its billion-plus population surviving in extreme poverty, and two-thirds of its people poor enough to have extremely circumscribed opportunities to lead a fulfilling life. To become a prosperous, high-income country in the next two decades, India will have to achieve, over that time-span, economic growth that is super-fast and inclusive. By ‘super-fast growth’, I mean a growth rate of 8 per cent a year or more; by ‘inclusive growth’, I mean growth that is widely shared. The magnitude of the task can be understood by contemplating the sobering fact that fewer than half-a-dozen of the 200-odd countries in the world have achieved super-fast and inclusive growth for two or more decades on the run, and almost all of them were autocracies during their rapid sprints. Can a democratic India do a China or a South Korea? That is the overwhelming question. However, the current context is that far from speeding up, India’s growth has shown signs of slowing down. While some temporary and special factors are involved, it is also the case that the ‘partial reform model’ that has been in operation since 1991 has been running into diminishing returns. India urgently needs another round of radical reforms to keep the engine of productivity growth firing on all cylinders. The list of desirable reforms is long but in my opinion they should have a common thread or theme, which is to put right the balance between the state, the market, and the private sector. Despite some liberalization, India has not fully recovered from a bad case of old-fashioned socialism, with its fond belief in the benefits of state ownership of the means of production, and its marked propensity for arbitrary state intervention in the operation of the markets. We have yet to complete the move to becoming a modern social democracy. This implies retaining the socialist emphasis on shared prosperity, and the liberal-democratic emphasis on individual freedom and rights, while moving towards greater reliance on private ownership and the market mechanism, with the state performing competently its essential core functions. These core functions include provision of macroeconomic stability, smart regulation, correction of market failures, efficient income redistribution, and effective supply of public services. What does the social-democratic agenda imply for various areas of economic activity? Given the time constraint, I have to be selective. I shall discuss five areas in which radical reforms are required to achieve super-fast and inclusive growth for an extended period: State Ownership; Employment Creation; Deep Fiscal Adjustment; Quality of Education; and State Capacity. A wide swathe of economic activities was nationalized in India after independence, and especially during Mrs. Indira Gandhi’s prime ministership, for predominantly political reasons. In addition, state ownership was justified as a way to correct market failures, increase investible surpluses, and pursue wider social goals. The results have been blatantly unsatisfactory. Public sector managers who were given a multiplicity of aims, and were backed by the deep pockets of the state, lacked the rewards and penalties to innovate, cut costs, and respond to consumer preferences. At the same time, there was a good deal of unproductive scrutiny by investigative agencies, which served to make managers risk-averse, and opt for a quiet life. Efficiency was also compromised by the incestuous relationship between nationalized industries and the government, which opened the door to political manipulation in operational matters as well as board appointments. Supervision of public sector enterprises (PSEs), via ‘memoranda of understanding’ with the government, has not worked to increase productivity. What has worked, up to a point, is allowing private-sector entry. Even so, success has been far from complete. This is because the logic of competition requires that the government maintain a level playing field between PSEs and private companies, which includes allowing PSEs to die if they continually underperform. Not surprisingly, the government has been unwilling and unable to follow such a path. The consequences can be seen in the most recent Public Enterprises Survey, which makes depressing reading.2 One-third of the 244 non-financial Central PSEs made losses in 2015/16; and of the 78 loss-makers, more than a half made losses for three years in row. There are also several perennial loss-makers, including Air India and two public telecom companies; and some profitable companies such as Coal India owe their performance not to efficiency but to their monopoly positions. The profitability of Central PSEs, as a whole, has been declining steadily for the past 10 years. In addition to Central PSEs, there are around 1000-odd State PSEs, of which two-thirds make losses, including notably the zombie electricity distribution companies. The aggregate losses of all PSEs, central and state, amount to about one per cent of GDP annually. So far, successive Indian governments have been stuck with the fetish of 51 per cent ownership and have only flirted with the idea of privatization (though it appears that Air India is at last being considered for strategic sale). Most sell-offs have taken the form of so-called ‘disinvestment’, i.e. the sale of small slices of state-owned companies. Unlike privatization, disinvestment does not bring the full advantages of a change in managerial incentives and autonomy. The sale price is also bound to be adversely affected when the government does not relinquish control, which means that the minority sales have surely been made at unfavourable prices. It is high time the government grasped the nettle of mounting a substantial programme of privatization, at least of those PSEs that make losses or meagre profits. This applies especially to the tradable goods industries where the prevalence of domestic and international competition would prevent monopolistic pricing and exploitation of consumers. Privatization is likely to bring not only higher productivity growth but also a fiscal gain since non-performing PSEs could be sold at prices that exceed the present value of future dividends under state ownership. This gain could be used by the government to invest in socially beneficial activities that the private sector would normally avoid, such as rural roads and irrigation.3 The case for privatization is less clear-cut in those non-tradable industries where competition is hard to introduce. But in India’s tradable sectors, the case for a major boost to privatization is, in my judgement, conclusive. Does banking constitute a special case? I do not think so. Banking is amenable to competition; it is not a ‘natural monopoly’, so it is not a natural candidate for state ownership. Of course, there is some truth in the view that state-owned banks inspire confidence in depositors, thereby encouraging financial savings and making bank-runs less likely. However, in India, these considerations have been decisively offset by the downsides of state ownership. There is clear evidence that the performance of India’s public sector banks (PSBs) is sub-standard. The situation has got worse since the global credit crisis: stressed advances of PSBs now stand at around 16 per cent of total advances, compared with about 4.5 per cent in private banks (see Table 1). With other financial and productivity indicators, it is same story. Poor performance in PSBs is the result of the way in which they are governed, as documented in detail in the report of the Nayak Committee on bank governance.4 And poor governance, in turn, stems from the disempowerment of bank boards by the government, which has proved to be impossible to alter in India’s political culture. All this is highly commendable. But the basic problem of poor governance in PSBs will remain after recapitalization, with a high chance of a return to square one in future. Radical reform of bank governance is thus imperative, and in this context privatization has a major role to play. A triple-track approach would be desirable. Firstly, some non-viable PSBs should be forced to become ‘narrow’ banks. Secondly, in some viable PSBs, governance should be radically reformed, while retaining the state’s controlling stake. Thirdly, some viable PSBs should be privatized quite quickly. To modernize the banking system and improve its overall efficiency, India clearly needs large private sector banks to compete with large public sector banks. An essential first step would be to repeal the Bank Nationalization Act and bring PSBs under the Companies Act. This would give the government the flexibility to reduce ownership to any extent it chooses. To privatize, i.e. to cede control, it would, in practice, have to reduce its stake to 25 per cent or even lower, though it could, for a short transitional period, retain a so-called ‘golden share’. Needless to say, private banks can also become reckless and delinquent, so both public and private banks will need to be firmly regulated. In doing so, India would simply be following international best practice. All previous attempts to put real distance between the government and the PSBs have run into the sand. The ongoing extreme stress in the banking system has raised public consciousness about the dire state of PSBs, thereby offering a golden opportunity to make a radical departure. The current crisis is too good a crisis to waste. ‘Employment’ is now regarded by many commentators as the central long-term challenge facing the country. The crux of the problem is the shortage of ‘good jobs’ that have high labour productivity and therefore provide decent incomes. Such jobs are largely to be found in the organized sector, while most workers are bottled up in the unorganized sector. My focus here is on how to increase employment for low-skilled workers in the organized sector. I emphasize low-skilled workers because India cannot in one giant leap become a high-skill economy. To ask for a swift short-cut to hi-tech jobs for most workers is to ask for the moon. Even on optimistic assumptions, half of India’s labour force 10 years from now will have completed only secondary education or less; and one-third of the labour force will have completed only primary education or less.6 In the land of reality, not fantasy, India has perforce to create productive employment for millions of workers with modest education and skills who are already present in the unorganized sector or who will enter the labour force in the course of the demographic bulge. Needless to say, India’s capital and skill intensive activities could and should continue to grow rapidly, provided they are internationally competitive, which many of them now are. But India urgently needs extra growth of an inclusive variety, which can only come from expansion of relatively low-skilled jobs in the organized sector. Question: Where could the demand for labour-intensive products come from? Answer: Partly from India’s large internal market but also partly from the world market, which is very much larger. It follows that exports of labour-intensive goods will have to play a major role in driving employment growth. India has a decade or a decade and a half before this window is closed by automation. It is idle to pretend that there exists some other magical solution to the employment problem. How should the employment problem be addressed? Faster growth is itself part of the solution. Wage subsidies could play a helpful role. It goes without saying that we will need to address infrastructure and credit constraints, land-acquisition constraints, skill constraints, and the numerous and onerous bureaucratic obstacles to the ‘ease of doing business’ that deter the growth of firms, particularly the small firms that numerically dominate industry and services. A serious export promotion programme is also needed, especially to enable India to enter global value chains. Trade facilitation, trade liberalization (unilateral and via regional trade agreements), and genuine coastal economic zones where firms enjoy free trade conditions, will have to be pursued aggressively. However, without downplaying any of these policies, I want to focus today on two other elements of the policy package to underpin employment-intensive growth. The first is labour market reform.7 A major factor underlying the weak demand for low-skilled labour in the organized sector is India’s labour laws and regulations, which are some of the most rigid in the world. They were enacted years ago with the best of intentions but have ended up being profoundly job-destructive and anti-labour. Quite simply, they protect the interests of a small minority of incumbent workers in the organized sector at the expense of the vast majority. For any firm that employs more than a hundred workers, the Industrial Disputes Act makes retrenchment of jobs legally impossible without prior government permission. Just as bad, if not worse, the Act makes even flexible redeployment of labour within an enterprise very difficult. One legal way round is to employ contract labour. But contract labour leads to poor-quality jobs. Moreover, the Contract Labour Act prohibits the employment of contract labour in ‘core’ activities; and the definition of ‘core’ is left to administrative discretion. These and many other restrictions raise the effective cost of labour directly; or they raise it indirectly, given the hassle and uncertainty involved in circumventing them. As a result, domestic and foreign companies have every incentive to minimise labour use and avoid investing in labour-intensive industries. (In this connection, it is notable that foreign direct investment into India does not go into industries that use low-skilled labour). Exports of labour-intensive mass consumer goods require large-scale production in factories that employ large numbers of workers. There are many examples of such companies in China, and increasingly in Bangladesh and Vietnam, but very few in India. None of this will change without a drastic revision of labour laws. But trade unions would obviously be unwilling to give up iron-clad job security without some tangible benefits in exchange. So, labour market reform would be possible only it were negotiated with trade unions as part of a deal that includes more generous severance benefits, a better overall safety net, and more effective schemes for job-search and training, in other words, some strengthening of income security in exchange for some weakening of extreme job security. Such a negotiation would require high-level leadership by both the Union and State governments. The second element of the policy package for labour-intensive growth that I want to focus on today is exchange rate management, which is a joint responsibility of GOI and RBI. 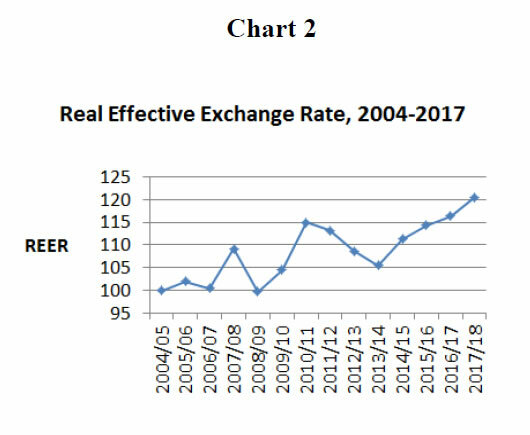 The medium-run evolution of India’s real effective exchange rate (REER) is striking (see Table 2 and Charts 1 and 2). 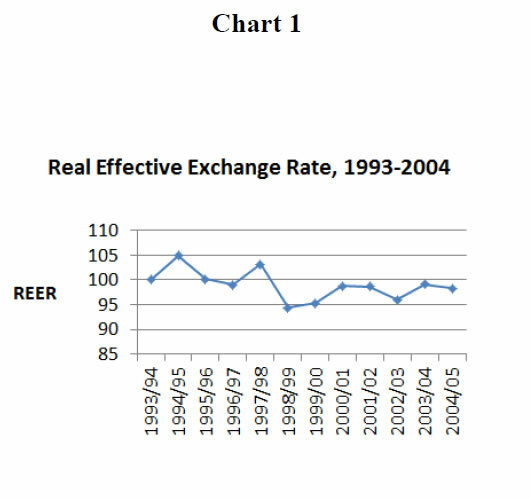 From 1993/94 to 2004/05, the real effective exchange rate moved within a fairly narrow band of +/- 5 per cent around a nearly flat trend. From 2004/05 to 2017/18, however, there has been a significant real appreciation. Indeed, in the nine years after the 2008/09 global crisis, the REER has appreciated at a trend rate of about 2.5 per cent a year. The question arises: Is it wise to have a strongly appreciating real exchange rate, given the need to maintain the competitiveness of exports, especially labour-intensive exports? It is hard to think of any country that has achieved sustained rapid growth without rapid growth in its exports. But India’s exports have been growing slowly. Slow growth of world trade has obviously harmed India’s exports in the present decade, in common with other countries. But India’s share of world exports, which need not be tied to the growth of world trade, has been totally stagnant over the same period. One has to wonder whether the real exchange rate is partly responsible. A possible justification of the trend of real exchange rate appreciation is that it simply reflects India’s faster productivity growth relative to the advanced countries. I mention this because such a view seems to have had some policy traction in India. There is a well-known proposition in international economics, attributed to Bela Balassa and Paul Samuelson, that if the home country were to have faster productivity growth in tradable goods than in non-tradable goods, relative to foreign countries, it would experience an equilibrium appreciation of the measured real exchange rate. (The ‘measured real exchange rate’ is the real exchange rate defined in the conventional way, wherein the overall consumer price index is used to deflate the nominal exchange rate index). A corollary of this proposition is that, in the specified circumstances, the home country’s measured real exchange rate appreciation would not indicate an equivalent decline in the international competitiveness of its tradable goods in general, and of its exports in particular. But attempts to test the Balassa-Samuelson hypothesis empirically have led to ambiguous and mixed results. One reason for this could be that the assumption that productivity grows faster in tradable than in non-tradable industries may not hold in general, or may hold in some periods but not in others. After all, telecom and financial services, large parts of which are in the non-tradable sector, have experienced very rapid technical progress. Moreover, there is no reason why a Balassa-Samuelson real appreciation is likely or desirable in countries characterized by surplus labour; and, correspondingly, we know that many fast-growing countries in East Asia have not shown a trend of sustained real exchange rate appreciation.8 It is doubtful, therefore, that the Balassa-Samuelson hypothesis is a reliable guide to exchange rate policy in India’s circumstances. (The implication is that India’s measured real exchange rate appreciation does correctly indicate a decline in the international competitiveness of its tradable goods, including its exports). I suggest that the relevant theory to understand India’s current situation is not the Balassa-Samuelson hypothesis but the ‘Dutch Disease’ hypothesis. India is in danger of succumbing to the so-called Dutch Disease because the exchange rate is being propped up by capital inflows to the detriment of manufacturing and services, especially tradable and labour-intensive manufacturing and services. Admittedly, preventing real exchange rate appreciation can be tricky.9 The policy instrument is not the real exchange rate but the nominal exchange rate. If home inflation is rapid, there is a temptation to prevent a nominal depreciation, and thus to permit a real appreciation, in order to help with inflation control. I suspect that this consideration influenced the exchange rate policy response to high inflation in 2009 and 2010. The downside was that the real appreciation contributed thereafter to a rise in the current account deficit to a dangerous level in excess of 4 per cent of GDP in 2011 and 2012, with various untoward effects. The lesson I would draw is that inflation control should, in general, be assigned to monetary and fiscal policy, not to exchange rate policy, thus liberating the exchange rate to achieve external objectives. This separation of monetary policy and exchange rate policy is of course a departure from the pure doctrine of inflation targeting. But it is made possible by the use of sterilized intervention and targeted capital controls. These policies are particularly useful when confronting another temptation to let the nominal and the real exchange rate appreciate, viz. large inflows of unstable foreign capital. To the extent that substantial inflows cannot confidently be expected to be permanent, there is a good case for resisting real appreciation. Of course, there are trade-offs. Sterilized intervention requires appropriate instruments. These do exist in India but need to be strengthened, as rightly argued in the report of the Patel Committee on the Monetary Policy Framework.10 Another well-known limitation of sterilized intervention is that it can impose some costs, economic and quasi-fiscal. It is sensible, therefore, to combine sterilized intervention with targeted capital-inflow controls and/or currency-based prudential controls. Some of these devices are difficult to re-introduce once they are taken off. But there are others, e.g. taxes, withholding taxes, and reserve requirements on certain non-FDI inflows, which can be tightened or relaxed as circumstances require.11 The costs of these various measures may well be less than their benefits for employment, exports, and growth. One other important point to bear in mind is that exchange rate policy, like monetary policy, operates with long and variable lags, so a competitive real exchange rate has to be in place for a fair length of time if it is to have an impact. An outsider should be wary of commenting on exchange rate policy without knowledge of all the policy compulsions; and I am certainly not going to talk in a public lecture about the appropriate numerical value or path of the exchange rate.12 Even so, I wonder about the wisdom of allowing significant real exchange rate appreciation in India, given a) the major importance of an export drive in achieving the country’s employment and growth objectives, and b) the more immediate danger that a large current account deficit could open up and interrupt an economic recovery. My overall view is that the GOI and RBI should lean less towards liberalization of debt inflows and inflows of hot money, and more towards maintaining a stable and competitive real exchange rate than has been the case in recent years. It bears re-emphasis that export promotion and employment creation will require a whole package of inter-connected policies, of which exchange rate policy is by no means the most important. Even so, I am convinced that a competitive real exchange rate will be needed as a supportive element of such a package. I now turn to a brief discussion of my remaining three topics. Even so, the process of removing distortions in the markets for goods and services is far from complete. Perhaps the most flagrant problem concerns price controls. Extensive price controls still remain on food, fuels such as kerosene and cooking gas, and many other key inputs such as fertilizers, electricity, water, and rail fares. These controls have a number of harmful effects. Firstly, they damage resource allocation. Since the prices charged are well below costs of production, investment in supply is discouraged and wasteful consumption is stimulated. Secondly, they create a fiscal burden since they require subsidies, either explicitly from the budget or implicitly in the form of losses or reduced profits for producers. Thirdly, they are hugely regressive, which is not surprising since a price subsidy per unit consumed provides larger benefits to those who consume more, i.e. to well-off people. The subsidies also leak all over the place and much of the money that is meant for the poor is pocketed by intermediaries. Investment and growth would be boosted by removing the subsidies and charging cost-reflective prices, while distributional concerns are handled by direct cash transfers, which are now increasingly feasible. The fiscal savings that would be created by the elimination of subsidies would be more than sufficient to compensate the poor for the loss of subsidies. The quantitative magnitude of central and state ‘non-merit’ subsidies is very large. A careful recent study has estimated that the total of such subsidies was 6.7 per cent of GDP in 2011/12.14 My calculations show that recent changes have brought this total down to around 6 per cent of GDP. However, the fiscal space would be considerably larger than 6 per cent of GDP, indeed as large as 10 per cent of GDP, if a few other obviously desirable measures were implemented, such as eliminating dysfunctional tax exemptions, selling off non-performing state enterprises, taxing agricultural incomes above a threshold level, and winding up some badly targeted poverty programmes (while retaining the ones that are effective). Thus, there is, in principle, enough potential fiscal space not merely to compensate the poor for the removal of subsidies but to: i) finance a basic income supplement for half of the population, or the whole of it (so as to avoid the problem of identifying the poor); ii) make large increases in public investment and desirable social expenditures such as education and health care; and iii) make a contribution to reducing the fiscal deficit.15 Combined with the improvement in resource allocation from the removal of price controls, the scheme as a whole would thus boost inclusive growth on several counts. Needless to say, a radical programme of ‘deep fiscal adjustment’ would require close coordination between the union and state governments. It would also face many political obstacles. But the prize would be enormous because there are so many constructive uses to which the fiscal savings could be put. Part of the problem arises from teaching methods. The system places an enormous emphasis on ‘finishing the curriculum’ in each year, whether or not children are actually learning. As a result, only a small layer of students at the top of the distribution keeps up; the rest fall behind and become progressively less interested. Another major problem is lack of commitment on the part of teachers. Teacher absenteeism is rife. Government teachers are well paid and heavily unionized; it is impossible to dismiss a teacher even for gross delinquency. Incentives are sharper in the private sector, and teachers put in more effort. Private schools also have somewhat better learning outcomes. Not surprisingly, people are voting with their feet and deserting government schools for private schools, even though they charge fees. Notably, private schools are considerably cheaper than government schools from the national standpoint because they pay teachers far less than their counterparts in government schools. Unfortunately, the Right to Education Act (2010) continues the mistaken educational policy of focusing on inputs, not learning outcomes.17 In particular, it fudges the crucial issue of teacher accountability. One controversial way forward would be a voucher system in which parents are given education vouchers, with the option to choose a public or private school for their children, with the government’s role confined to overall regulation. The implication would be that all schools would in effect receive a per-student grant, not a block grant; and if government schools were unable to attract students, they would have to close down. I am inclined towards this view, not on ideological but on pragmatic grounds. Starting from where we are, it is hard to see how teaching in government schools can be improved on the basis of internal reform alone, without the credible threat of competition and closure. Be that as it may, this much is clear: Unless India improves the quality of primary education by either a voucher-style competitive system or by undertaking a massive systemic reform within the existing framework, economic development is likely to be severely damaged. Reform of the state is just as important as repairing the relation between the state and the market. It is incomplete, even misleading, to characterize the content of economic reform as ‘rolling back the state’, pure and simple. There are limits to how much the state can leave or outsource to the private sector. There are some valuable things that only the state can do. On the quantitative side, it is not widely appreciated that though the state is over-bureaucratized, as evidenced by the complications that inhibit the ease of doing business, it is also under-staffed. Public sector employment is smaller now than it was 25 years ago, while the economy has grown massively. Even the elite Indian Administrative Service has shrunk by 10 per cent in the past two decades. The police force in the country has 25 per cent of posts vacant. India also has the lowest number of judges per head among G20 countries. The incidence of vacant posts in the judiciary is startling: 13 per cent in the Supreme Court, 29 per cent in the High Courts, and 21 per cent in the district courts. On the qualitative front, the situation is equally bad. The police force is stuck in the colonial tradition of crowd control rather than crime prevention. It is also deeply politicized, even at the top levels of investigative agencies. The judiciary has a huge backlog of cases: 32 million cases were pending in 2015, of which around 25 per cent have been outstanding for 5 years and 10 per cent for 10 years. The top civil service remains ‘generalist’ with little professional and lateral entry, and has become susceptible to intense political manipulation via staff transfers and postings. As already noted, at lower levels of government, productivity is extremely low in frontline services such as education and health care. Another area in which there are large quantity and quality deficits is regulation. This is a complex field that has seen many advances in analytical theory and international best practice. India is behind the curve. We need efficient regulation in many fields but many of our regulatory bodies suffer from lack of expertise, lack of independence, and weak human resources. Shortfalls are glaringly evident in regulating infrastructure services, and in designing and monitoring public-private partnerships. Too often, regulators are retired bureaucrats who are unwilling to stand up to politicians. India began at independence with relatively strong institutions. But there has been little effort to build on this platform, and the problem has now reached a stage where it needs urgent attention. There have been many committee reports but nothing much to show for them. Continued neglect would be hazardous because rapid and inclusive growth will be impossible in the long run without strong institutional foundations. One problem is particularly worth highlighting. Human resource management in government is very poor. Unsatisfactory processes of selection, training, and promotion are widely prevalent, and account, in no small measure, for the incompetence of personnel and their lack of accountability to citizens. How to get government functionaries to internalize the mission of serving the public interest is an unsolved problem of cardinal importance. I shall end with one final remark about desirable reform in India: India needs both less of the state and more of the state. It needs ‘less of the state’ because the state has become over-extended in areas outside its comparative advantage. But it also needs ‘more of the state’ because the state does not perform competently the core functions that lie squarely in its domain. How to combine ‘less of the state’ with ‘more of the state’ will be the central challenge of India’s economic reforms. Note: The REER index is based on 36-country bilateral export weights. * Fifteenth L. K Jha Memorial lecture delivered at the Reserve Bank of India, Mumbai on December 11, 2017. The views and opinions expressed are those of the author alone. 1 See Vijay Joshi (2016), India’s Long Road – The Search for Prosperity, Penguin Random House, New Delhi, and Oxford University Press, New York. 2 See Government of India, Public Enterprises Survey, 2015/16, Vol. I. 3 See Vijay Kelkar (2010), “On Strategies for Disinvestment and Privatization” in U. Kapila , Indian Economy since Independence(21st edition), Academic Foundation; and Vijay Joshi, (op.cit. ), Chapter 7. 4 Reserve Bank of India (2014), Report of the Expert Committee to Review Governance of Boards of Banks (Chair: Dr. P.J. Nayak). 5 For an analysis of public sector banking, past, present, and future, see Y.V. Reddy (2017), “Future of Public Sector Banking”, Professor D.T.Lakdawala Memorial Lecture, 17 November. 6 See World Bank (2011), More and Better Jobs in South Asia. 7 See Jagdish Bhagwati and Arvind Panagariya, Why Growth Matters, Public Affairs, Chapter 8; and Vijay Joshi (op.cit), Chapter 5. 8 If the Balassa-Samuelson theory had empirical validity, one would see a sustained trend of bilateral real exchange rate appreciation of fast-growing East Asian countries against the U.S. dollar. This has not been the case for most of them (the exception is Japan for three decades from 1960). This implies that these countries at least maintained and perhaps improved their international competitiveness in tradable goods over time. I am grateful to Dr. Kamakshya Trivedi for making the relevant data available to me. 9 For an analysis of India’s exchange rate policies, see Vijay Joshi (2016), (op.cit), Chapter 8. 10 See Reserve Bank of India (2014), Report of the Expert Committee to Revise and Strengthen the Monetary Policy Framework (Chair: Dr.Urjit Patel). 11 See Jonathan. Ostry et.al. (2011), “Managing Capital Inflows: What Tools to Use”, IMF Staff Discussion Note 11/06; and Atish Ghosh and Mahavash Qureshi (2016), “What’s In a Name? That Which We Call Capital Controls”, IMF Working Paper WP/16/25. 12 A possible ‘compulsion’ is to avoid being put on the U.S.Treasury’s ‘monitoring list’ for ‘exchange rate manipulation’. I do not think that being put on the list matters all that much. India is very far away from having a persistent current account surplus of three per cent of GDP, which is one of the criteria for being classified as a ‘manipulator’. In any case, the aim of faster export growth in India is not to produce current account surpluses but to boost employment-intensive growth, and enable further import liberalization on efficiency grounds. Higher growth of GDP, along with import liberalization, would raise import growth. There is no reason why an increase in export and import growth should result in a current account surplus. 13 The introduction of the GST was also marred by various design problems in addition to the multiplicity of tax rates and exemptions: see Indira Rajaraman (2017), “Further Reforms are Needed for the GST to Succeed” Mint, November 3. 14 See Sudipto Mundle and Shatadru Sikdar, (2017), “Budget Subsidies of the Central Government and 14 Indian States”, Ideas for India, 14 March. 15 See Vijay Joshi (2016), op.cit., Chapters 6 and 10; and Vijay Joshi (2017), “Universal Basic Income Supplement for India: A Proposal” Indian Journal of Human Development, Vol.11(2). My calculations show that a universal basic income supplement set at a level equal to the difference between the Tendulkar poverty line and the current average income of the poor would cost 3.5 per cent of GDP. 16 See Pratham Educational Foundation (2017), Annual Status of Education Report (Rural), 2016. 17 See Karthik Muralidharan (2013), “Priorities for Primary Education Policy in India’s 12th Five Year Plan”, India Policy Forum 2012/13, Vol. 9; Jean Dreze and Amartya Sen (2013), An Uncertain Glory: India and its Contradictions, Penguin Books, Chapter 5; and Vijay Joshi, (op.cit. ), Chapter 9. 18 See T. N. Ninan (2015), The Turn of the Tortoise, Penguin Random House, Chapters 5, 8, 9, and 10; Devesh Kapur, Pratap Mehta and Milan Vaishnav (2017), Rethinking Public Institutions in India, Oxford University Press; and Vijay Joshi, (op.cit. ), Chapter 11.